Chef Mineno is one of the most prominent sushi chefs in the UK, if not in Europe, and is respected by his colleagues for his outstanding knife skills. His career started in his late teens, initially as a kaiseki chef in Japan. Having grown up in Shizuoka, a prefecture in Japan renowned for its rich variety of seafood, fresh wasabi and flavoursome green teas, Mineno’s taste buds couldn’t have asked for a better start. It is no wonder why Mineno's passion in his mastery of sushi, lies in simply bringing out the stunning flavours of every ingredient without overpowering it. In 2004, within just three years of working at Nobu Group’s Ubon in Canary Wharf, Mineno became the Head Chef at the restaurant; his talents and his efforts were quickly recognised. He continued to explore different styles and forms of Japanese cuisine at Ubon until 2009. In October 2010, Mineno, together with his close friend Ikeda, opened their first restaurant, 'Yashin Sushi & Bar' in High Street Kensington. Following the success of Yashin Sushi & Bar, in September 2013 the pair opened their latest venture in South Kensington, Yashin Ocean House centred around a head to tail dining concept. Chef Ikeda entered the culinary world at the age of 15 and has been a professional itamae for more than half of his entire lifetime. As well as his mastery of sushi, Ikeda is a long time disciple of kaiseki, Japan’s most intricate and respected form of culinary art. charismatic personality were recognised and valued by his colleagues and his customers. It was indeed here that the concept for his own restaurant, 'Without Soy Sauce' was born. 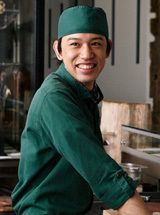 As he served his sushi at the counter, Ikeda noticed that many of his customers were dipping the rice into the soy sauce (as opposed to the fish), or were putting too much soy sauce on the sushi, thus the only flavour that could be tasted was the soy sauce alone and along with Shinya opened Yashin Sushi & Bar based around this concept. The opening of Yashin Ocean House in 2013 allowed Ikeda to introduce another unique dining concept to London diners, ‘Head to Tail’ dining. Ryuichi Furukawa began his culinary career while studying Interior Design and working part time in a local restaurant in his home town of Shiga in Japan. 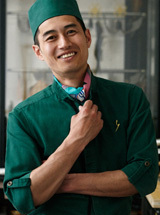 Over time, he began to observe common traits between the art of cooking and the thought process behind designing; the procedure of preparing and presenting a dish, the consideration behind ways to please the people, and the creativity involved in offering uniqueness, were all linked in Ryuichi’s two professions. After graduating, he was firm that his true passion lay in cooking and decided to pursue a career as a professional chef. He started in Italian cuisine where he developed a range of skills to qualify him as a versatile international chef. During this time, Shinya Ikeda was the head chef of the prestigious “Yumi” restaurant and on the hunt for talented and passionate experts for his kitchen. He hand-picked Ryuichi, whom he knew through mutual acquaintances back in Japan, and invited him to the UK to work in Yumi. 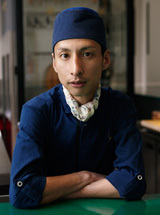 Ryuichi gained further expertise while working under Shinya, and after Shinya moved on to open Yashin Sushi with Yasuhiro Mineno, he continued to perfect his skills as a sushi chef in the widely popular Zuma in London. Ryuichi quickly became known for his precise, perfectionist character, which was mirrored in his cooking. Each dish prepared by Ryuichi is noticeably meticulous, with much thought gone into the specific cut, arrangement, accompaniments, and amounts of each ingredient. At Zuma he created his own personality and cooking style, and with several years of experience in a fine-dining Japanese restaurant, he took up the position of head chef at Yashin Sushi.